I think I might be earning myself a reputation in the office block, though perhaps not a good one! I have the good fortune to work for a company that doesn't mind what you wear to work, so long as you wear business dress when visiting customers - a good philosophy, I think. Of course, this is within reason - wouldn't want people turning up in their bathing costumes in Summer. Certainly not with this lot: 5 guys and 1 lady, none of whom I have any desire to see even an inch of flesh, thank you very much. 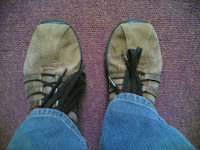 Yesterday, I wore these brown casual shoes which started to make my instep ache, so I took them off for most of the day. It was such a nice feeling, that I didn't bother putting them back on when I went to the gents. Normally, you would expect that putting yourself in a position to get hurt is just tempting fate, but not one puddle or scout stone did my sock-clad feet find - try saying that pished! It had to happen, someone entering the gents just as I was about to leave, and seeing me pulling my socks up. With the look he gave me, you'd think I'd just got dressed in the middle of the room! Well, I'm not called Odd for nothing! Why else would I show a pic of my shoes?!?! When he did finally pull back into the slow lane, he was busy texting someone! I guess he must have been a foreign diplomat and exempt from our laws ... if so, they're dressing down a bit nowadays! Nice shoes! You were brave risking that though in the gents. Very surprised you didn't come across any puddles! In our office it's not just puddles you're in danger of treading in.